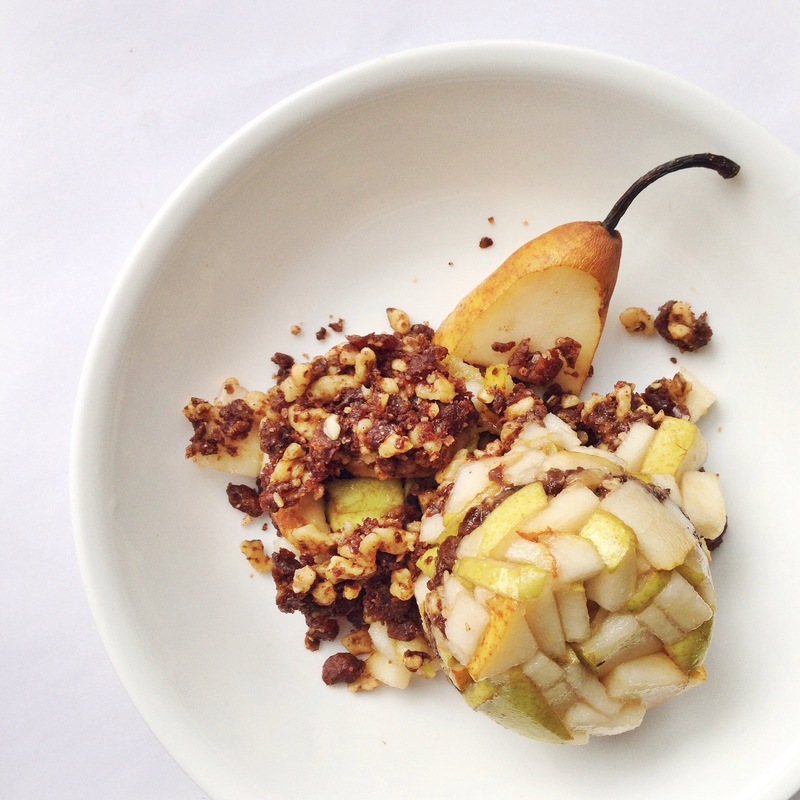 Raw Pear & Walnut Crumble. | Eat More Plants. I love pears! Let’s talk about them for a moment. The skin of a pear contains at least 3 – 4 times as many nutrients as the flesh. Don’t peel those pears!! Buy them organic, give them a wash when you get home and eat them whole. The skin contains antioxidants, anti-inflammatory phytonutrients as well as LOTS of fiber (yay!). Choose pears that are firm. Place them in a paper bag (with some bananas if you have) to let them ripen more quickly. Pears usually take 3-7 days to ripen. When they feel soft to the touch around the stem area, they’re good to go. They should not be mushy but the should give a little when you put pressure on the flesh. I chose anjou and bosc pears for my crumble because I like them the best. The anjou is sweeter and a bit juicier when ripe and I think they pair well together, pun intended. This is a great breakfast! It’s super quick and hits my taste buds in the right spot. Pit and chop 5 soft medjool dates and toss them in a blender or food processor. and a pinch of sea salt. Process until crumbly and uniform in texture. Rough chop 2 ripe pears. 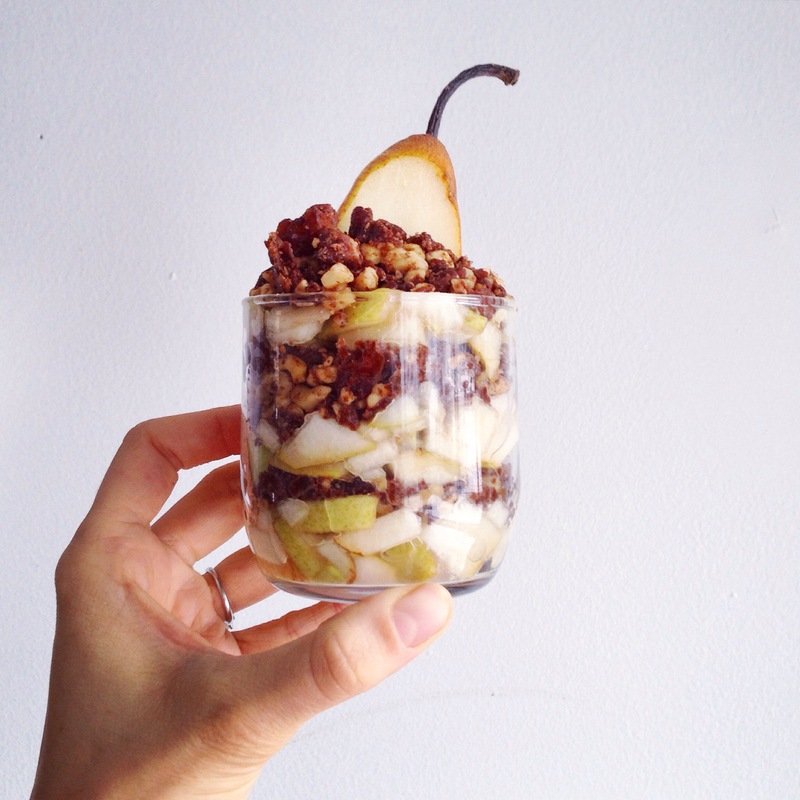 Layer them in a parfait glass with the crumble or just pile it all into a bowl and chomp away. If you want, you could put this in a oven safe dish and bake it at the lowest temperature possible (usually it’s somewhere between 150 and 175 degrees F) for 15-25 minutes. This will give you an apple pie like, warm and cozy dish! I am thinking about putting into the dehydrator :). Thanks again for inspiration! Celine posted another great idea for breakfast – packed with vitamins, minerals, complex carbs, and it’s #glutenfree, #dairyfree, #grainfree! Also a nice primer on the goodness of pears. Yay!